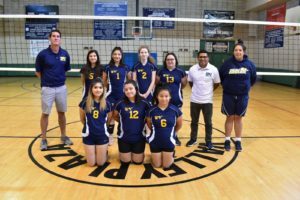 Summit View’s Girls’ HS Varsity Volleyball Team is a proud member of the California Interscholastic Federation Southern Section and is a participating member of the Omega League. The 2018-2019 schedule is posted below. Email Coach Raul Pastor at rpastor@summitview.org or Coach Ian Dwyer at iandwyerconst@gmail.com for more information. Go Eagles! 10/8 vs. SCVI Legacy Volleyball 28369 Constellation Road Santa Clarita @2 pm.